Over the years, we have written hundreds of articles on medical preparedness for short or long-term disasters. Many now include medical kits and supplies to add to survival food storage and items for personal protection. Yet, few who are otherwise medically prepared seem to devote much time to dental health. Poor dental health can cause issues that affect the work efficiency of members of your group in survival settings. When your people are not at 100% effectiveness, your chances for survival decrease. History tells us that problems with teeth take up a significant portion of the medic’s patient load. In the Vietnam War, medical personnel noted that fully half of those who reported to daily sick call came with dental complaints. In a long-term survival situation, you certainly will find yourself as dentist as well as nurse or doctor. Anyone who has had to perform a task while simultaneously dealing with a bad toothache can attest to the effect on the amount and quality of work done. If your teeth hurt badly, it’s unlikely that your mind can concentrate on anything other than the pain. Therefore, it only makes sense that you must learn basic dental hygiene, care, and procedures to keep your people at full work efficiency. It could easily be the difference between success and failure in a collapse. In normal times, however, you should understand that the practice of dentistry without a license is illegal and punishable by law. Seek modern and standard dental care wherever and whenever it is available. The prepared medic will have included dental supplies in their storage, but what exactly would make sense in austere settings? You would want the kit to be portable, so dentist chairs and other heavy equipment wouldn’t be practical. You would want it to be easily distinguished from the medical kit. We’ve mentioned that gloves for medical and dental purposes are one item that you should have in quantity. Don’t ever stick your bare hands in someone’s mouth. Buy hypoallergenic nitrile gloves instead of latex. 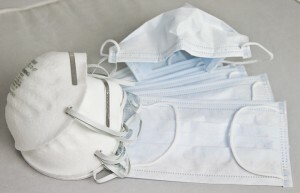 For additional protection, masks should also be stored and worn by the medic. • Dental floss, dental picks, toothbrushes, toothpaste or baking soda. • Dental or orthodontic wax as used for braces. Wax can be used to splint a loose tooth to its neighbors. • A Rubber bite block to keep the mouth open. This provides good visualization and protection from getting bitten. A large eraser would serve the purpose. • Cotton pellets, Cotton rolls, Q tips, gauze sponges (cut into small squares). • Compressed air cans or a bulb syringe for drying up saliva on teeth. • Commercial temporary filling material, such as Tempanol, Cavit, or Den-temp. It’s important to know that eugenol might burn the tongue, so be careful when touching anything but teeth with it. • Zinc oxide powder; when mixed with 2 drops of clove oil, it will harden into temporary filling cement. Here’s a video of the procedure. 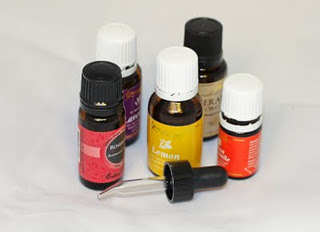 • Oil of oregano, a natural antibacterial. • A bulb syringe to blow air and dry teeth for better visualization, and as a diagnostic tool to elicit discomfort in damaged teeth. A can of compressed air may be an alternative. • Dental probes, also called “explorers”. • Dental scrapers/scalers to remove plaque and probe questionable areas. • Spoon excavators. These instruments have a flat circular tip that is used to “excavate” decayed material from demineralized areas of a tooth. A powered dental drill would be a much better choice, but not likely to be an option off the grid. • Elevators. These are thin but solid chisel-like instruments that help with extractions by separating ligaments that hold teeth in their sockets. #301 or #12B are good choices. In a pinch, some parts of a Swiss army knife might work. • Extraction forceps. 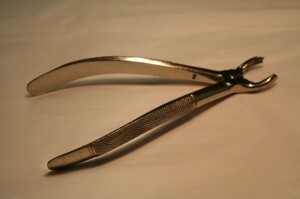 These are like pliers with curved ends. They come in versions specific to upper and lower teeth and, sometimes, left and right. -#150A or #150 for upper front teeth. • Blood-clotting Agents: There are a number of products, such as Act-Cel, that help control bleeding in the mouth after extractions or other procedures. It comes a fabric square that can be cut to size and placed directly on the bleeding socket or gum. • Sutures: A kit consisting of a needle holder, forceps, scissors, and suture material is helpful for the control of bleeding or to preserve the normal contour of gum tissue. We recommend 4/0 Chromic catgut as it is absorbable. It’s small enough for the oral cavity but large enough for the non-surgeon to handle. Don’t forget a small scissors to cut the string. More information on suture materials can be found later in this book. • Pain medication and antibiotics. Medications in the Penicillin family are preferred if not allergic. For those allergic to Penicillin, Erythromycin can be used. For tooth abscesses, Clindamycin is a good choice. These antibiotics are discussed in detail in the section dedicated to them in this book. Just as obtaining knowledge and training on medical issues likely in a disaster is important, the study of dental procedures and practices is essential for the aspiring survival medic. Joe Alton, M.D., [send him mail] aka Dr. Bones, is an M.D. and fellow of the American College of Surgeons and the American College of OB/GYN. Want To Get Fit Fast?